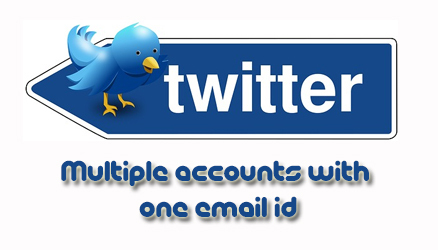 How to create multiple Twitter accounts with one email id? Twitter is one of the fastest growing social networking site which allows the registered users to post tweets. So now let’s move on to the main topic on how to create multiple Twitter Accounts with one single email id. You might have been noticed that once you register an account on Twitter with one email id you can’t register again a new fresh Twitter Account with the same email id. So if you are willing to create another Twitter account with different name you will not able to register new account with already registered email id on Twitter. So to solve this problem to manage all Twitter account with single email id here is the trick which you can simply use to Sign up multiple Twitter Accounts with one email id. Method 1: for e.g. if you have signed up Twitter Account with “[email protected]”, again Twitter will not allow to register a new account with same email id. But here is the small trick which will allow you to signup multiple Twitter Accounts with single email id, while signing up for a new Twitter account you will have to use “[email protected]” and you will easily able to sign up a new Twitter Account and the confirmation mail will also get delivered to your same email id. So you can create multiple Twitter accounts by putting dots in the email username. Note: Dot in the email id username “[email protected]” will be considered as fresh valid email id even though they belong to one email inbox. Method 2: The second method will allow you to create two Twitter Accounts with one email id, while signing up for Twitter for first account you can use @gmail.com and for the second twitter account you can use googlemail.com.